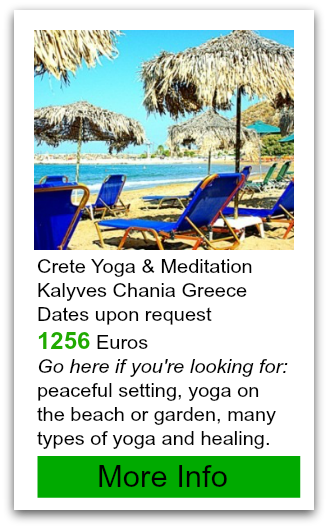 Some of these yoga holidays in Greece listed below are ongoing some are planned specific dates, and some of them are even by request. All of them look wonderful to me! When travelling to Greece plan for gorgeous weather and bring your walking shoes, as there are so many great things to explore. Instructor Kristina Karitinou is one of the very few people in the world who is fully certified to teach Ashtanga Yoga by Sri. K Pattaabhi Jois, and because of this she is a well known and respected teacher...keep reading! Located on a private island and room for only 12 guests your experience with be exclusive! Some activities are included like kayaking and exploring the island. All the rooms come with a view of the Aegean Sea. 3 vegetarian meals daily is provided, made from fresh local produce. Many of the extras are included on this retreat including boat transfer to the island. Dates: Almost ongoing through until October. Located beachfront on the undeveloped Triopetra Beach this yoga retreat was named “One of Europes most inspiring Yoga stays” by Columbus magazine. Yoga Rocks Retreat center is smoke free, alcohol free and vegetarian, with all but one meal included. They host many different retreats and instructors through out the year and in doing so cover pretty much every style of yoga there is! You name it they have a world renowned instructor who is there to teach it. What a beautiful old stone house they have for accommodations! They host regular retreats throughout the year, and specifically do a lot of Iyengar Yoga. Non yogi partners are welcome and are only 400 euros per week. Some of the meals are included but they wanted to give you freedom to choose a night out at local restaurants too! 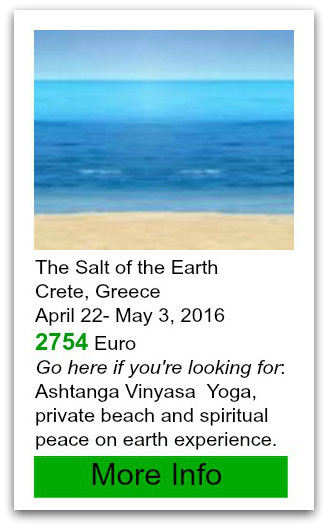 Cost: 540-720 euros per person per week.